Home » Our Blog - Punta Cana Secrets » Punta Cana golf clubs – take golf lessons during your beach holiday! The Dominican Republic attracts a lot of attention thanks to the wonderful golf courses and Punta Cana golf packages that it has. This Caribbean country has a unique opportunity to play golf. Here you will find high-class courses surrounded by extraordinary landscapes of the sea, tropical forests and mountain peaks. Thus, celebrities, world champions and golf enthusiasts from all over the world come here to enjoy the beauty of the game on these Punta Cana golf courses. What Golf clubs are there in the Dominican Republic? There are 26 active Golf clubs in the Dominican Republic. 5 of them rank in the list of the best Golf clubs in the world. These are Casa de Campo, Playa Dorada, Playa Grande, Casa de Campo and Punta Cana Resort & Club. Golfweek magazine has included 9 Dominican Golf courses in the top 50 best Golf clubs in the Caribbean and Latin America. The main Dominican centers of Golf tourism are Casa de Campo in La Romana, Punta Cana, Juan Dolio and Puerto Plata. Some of the famous Golf courses are specially built in hotel and residential complexes. They are aimed at high-income tourists and offer Punta Cana golf packages. What are Punta Cana golf clubs? 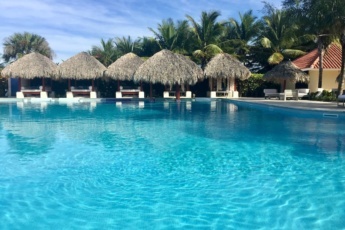 Punta Cana is the most popular tourist destination in the Dominican Republic. This resort attracts those who seek beach holidays, azure warm ocean and all kinds of entertainment. Punta Cana gives you a unique chance to try yourself in Golf. This is a great opportunity for both amateurs and beginners who want to get a new entertaining experience. There are 8 Punta Cana Golf courses: Punta Espada, La Cana, Cocotal, Corales, Las Iguanas, Punta Blanca, White Sands, Iberostate Golf Club. Notably, famous landscape designers took part in the development of the Golf courses. The first one, Punta Espada Golf club is the first work of the legendary designer Jack Nicklaus in the Caribbean region. The course is more than 7000 square meters. The design takes into account the local landscape. You can enjoy magnificent views of the Caribbean sea. Several holes overlook the ocean. La Cana is a beautiful Golf club located a ten minute drive from Punta Cana international airport. Its infrastructure includes a huge 6.5 km long field, a small cafe, as well as a shop where you can buy or rent the necessary equipment. This Golf club has four holes designed for top-level professionals, as well as 12 holes with sea views for beginners and inexperienced people. This is a 18-holes course with six Caribbean oceanside holes. Tom Fazio designed this Punta Cana golf club, taking the best of the dramatic landscape with natural cliffs, bays, ocean coves and the inland lakes. This 18 holes course has a quiet and very secluded location. It’s interesting to note that world-famous Jack Nicklaus designed Las Iguanas Golf Course. Moreover, the golf course of this club is located next to the reserve and give the opportunity to enjoy the untouched nature of the island. This is the first golf course in the Caribbean designed by the famous golf player and designer Nick Price. The golf course is surrounded by dense vegetation, wetlands and lakes. It’s a 18-holes golf course interesting for all levels of players. White Sands is a magnificent 18-holes Punta Cana Golf course, considered one of the best on the entire South Pacific coast. Here various Championships are held. Nevertheless, this place is ideal for experienced players and beginners. There are holes of different complexity and length. White Sands has a well-developed infrastructure, including hotels, restaurants, clubs and shops. The Iberostate Bávaro Golf Club, designed by P. B. Dye, looks really unique. In this case, the architect tried to pay special attention to the contrast of white sand and stones with bright green grass. In fact, the impressive landscape of the 18-holes course combines artificial lakes, streams and even desert terrain. Besides, the Golf course is part of the Iberostar hotel and the Arena Gorda residential complex. And the last, Cocotal is a beautiful Golf complex, founded by the Spaniard Jose Gancedo. A variety of tropical trees, as well as lush coconut trees, grow throughout this 27-holes Golf course. By the way, it has repeatedly become the venue for several Dominican Championships. 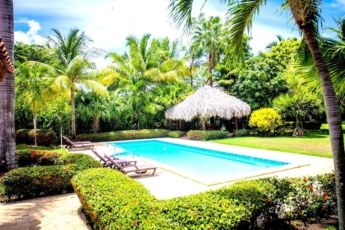 You have a unique chance to book our apartment and condo in Cocotal Golf & Country Club. 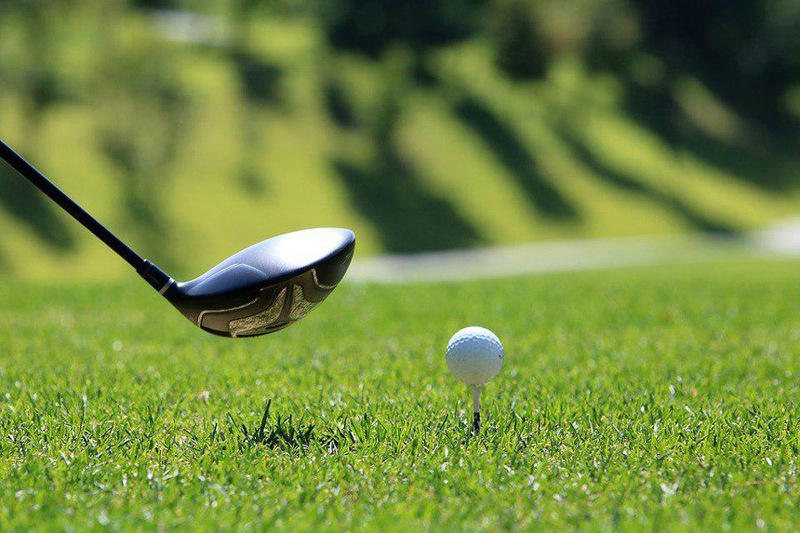 Enjoy the comfortable quiet secure atmosphere of the area and take Golf lessons!